CLARK COUNTY — Thousands of Clark County school children will not be going to school on Wednesday, as hundreds of teachers across the region head out onto the picket lines. None of the districts still trying to settle the question of how much teachers should be earning in the wake of the legislature’s funding boost this Summer have reached a deal yet. That means only La Center schools will start on time. Teachers across the state have been pushing for raises from 15-25 percent following the legislature’s decision to provide an additional $2.1 billion in funding over the next two years. Districts say the legislature’s decision to also cap local levies means they’ll be facing a budget deficit at the start of the new year. The same applies for certificated administrative staff, as well as classified staff. Meanwhile, some school boards are considering moves designed to put added pressure on teachers to make a deal sooner rather than later. The Vancouver school board, in a special session on Tuesday, debated several resolutions that would lock teachers out of classrooms, considered their strike to be an unexcused absence that could lead to termination, cut off pay after Sept. 10, and cut off healthcare premiums after Sept. 17. In a statement, Superintendent Steve Webb said they don’t plan to take such drastic actions immediately, but see them as “contingency resolutions”. 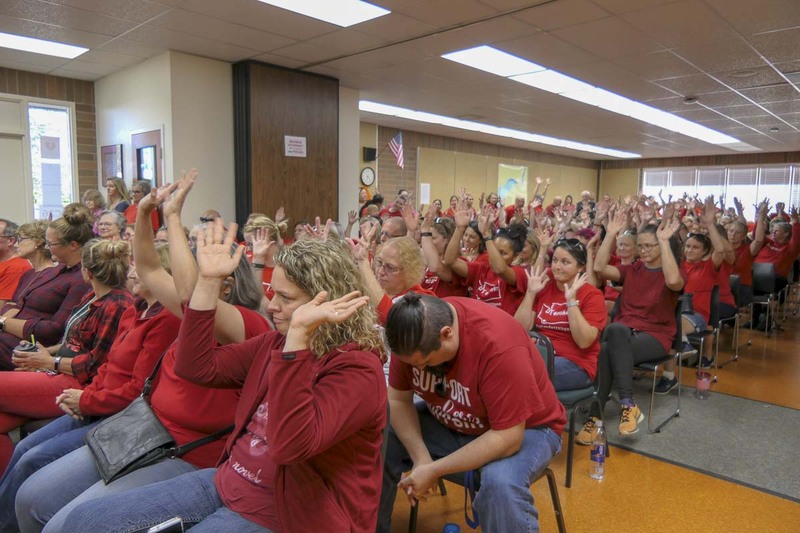 Evergreen School District has taken similar measures, and both districts could consider a lawsuit seeking an injunction to force teachers back to work, likely arguing that the strike causes material harm to the people of the district, as well as the schools themselves. Increasingly, districts and education association presidents alike have laid much of the blame for this impasse at the feet of lawmakers who passed the McCleary funding. Rep. Liz Pike, a Camas Republican who is not running for re-election, said she believes legislators will be back next year, seeking to overturn the local levy cap because school districts will have spent all the extra money given to them on teacher salaries, and not have money to fulfill the other part of the McCleary mandate, which was to reduce class sizes. In separate statements, pretty much all of the districts said they will continue to hold bargaining sessions in an effort to reach a deal. State mediation through the Public Employee Relations Committee has been requested by nearly two dozen school districts across the state, including nearly every district in Clark County.